NOoSPHERE Arts is an artist-run 501(c)(3) nonprofit based in New York City. Founded in 2011 by Norwegian-born visual artist Sol Kjøk, the organization produces exhibits, performances and other public art programming. As reflected in our motto, “Art from Elsewhere”, NOoSPHERE Arts seeks to serve as a bridge between international artists and the NYC art world: Our goal is to offer the U.S. audience access to current art from other countries and to bring creative people together for artistic cross-pollination and transnational collaborations. NOoSPHERE Arts was initially conceived as a platform for showing work by contemporary artists from Norway. Our original name — NO ‒ Art from Elsewhere — was thus chosen because NO is the domain name extension for Norway and a Norwegian word for “now”. Later, as our programming of exhibits and live arts expanded to include works by artists from countries all over the world, the word NO was changed to NOoSPHERE, a reference to the term used by Teilhard de Chardin and Vladimir Vernadsky referring to a “sphere of human thought” which encircles the globe and joins humankind in a planetary, collective consciousness. The decision to close the Houston Street gallery in 2016 arose because NOoSPHERE Arts’ Founding Artistic Director was offered to use a raw industrial loft inside a soundstage complex in Brooklyn as her personal painting studio. Sol took the opportunity to turn the space into a collaborative arts platform called Last Frontier NYC, with the name referring to its waterfront Greenpoint location: a final outpost of industrial New York in a rapidly gentrifying city. She sees her workspace as “a campfire where the creative tribe can share its stories”, complete with a teepee for community gatherings. Last Frontier NYC inaugurated its public programming in the fall of 2015 with the multidisciplinary collaboration Whispering Voices: a Ritual for Our Time, an immersive live installation of sound, movement, images, and forms involving six artists. is a combined live-work space and presentation arena for international artists across multiple disciplines. Run by a permanent crew of three women sailors, the arts collective’s mission is to support and promote creative colleagues at all career levels through residencies, public shows and collaborative opportunities; build sustainable transnational artist networks; and help retain creative forces in New York City. 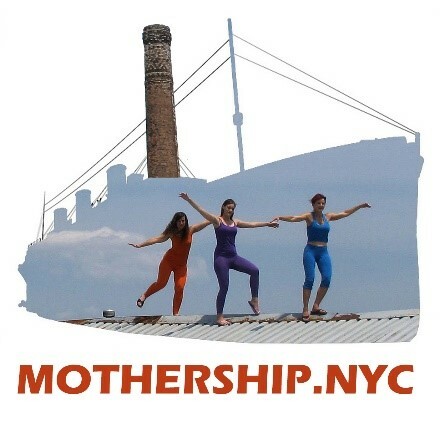 With a regular residency program in place since 2016, Mothership NYC serves as the host of the annual NOoSPHERE Arts Residency Award.